1) Castech have state of the art facilities and technical knowledge to ensure we manufacture high quality Precision Mouldings. 2) Our Precision Moulds are manufactured to very high quality standards. We are proud to have ISO 9001:2008 accreditation. This ensures high quality standards are met by following our Quality Manual. We also ensure finished Mouldings go through thorough quality checks to make sure they are perfect when they reach our customers. 3) At Castech we use the latest developments in resin, plastic and composite materials to manufacture your Moulds to high standards. 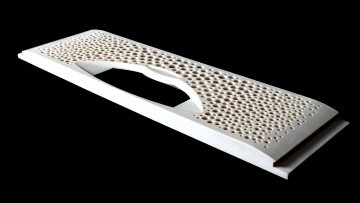 Also using the latest advances in polyurethane technology our Moulds are strong, dense and impact resistant. 4) We use 3D CAD, CAM and CNC Machining technology to produce high quality Moulded Components efficiently and economically. 5) We have our own in house painting facility. We use conventional acrylic paints to ensure your components are finished to a high standard. 6) At Castech we manufacture your Precision Mouldings at competitive prices and look to add value and reduce costs wherever possible. 7) From the beginning our technical staff will provide help and guidance to ensure your design is perfect for our manufacturing method. We can also Mould special features to your design which can reduce the amount of machining required, including threads, studs, bushes and complex apertures. Finishing costs can also be reduced because of this. 8) We are happy to undertake full product assembly and packing, using free issued or brought in parts to provide further cost savings for our customer and to avoid handling problems. 9) All our components are packaged securely and carefully to ensure they arrive to you in the same condition they left us in. We also use TNT Express Insured Delivery as standard. If you require a different courier option, please let us know. 10) At Castech we manufacture your precision Moulds with fast competitive lead times. We specialise in delivering small/medium batches. For more information on our Polyurethane Moulding Manufacturing Method – please click here.